Mechanical watches can last a lifetime, because they are repairable. They need not become obsolete, be discarded in landfills, or expensively recycled like electronic watches, mobile phones and computers. ochs und junior sells no more than 300 mechanical watches per year and is always looking for ways to benefit its customers and lessen its impact on the environment. Earth Day, when events are held in 192 countries to show support for protecting the environment, seemed like the right time to share some of ochs und junior’s current efforts. Simple cardboard flats for packaging. ochs und junior watches come strapped to a cardboard flat instead of enclosed inside a large luxury display box, like other mechanical watches. This saves materials, and the cardboard is easy to recycle. Plus, customers pay for their watch, and not a fancy display box. The only other ochs und junior accessory is a leather travel pouch (more on the leather we use below). Vegetable-tanned leather straps and pouches. ochs und junior’s rhubarb-tanned leather straps and pouches are manufactured by IVN-certified Ecopell, and do not use heavy metals like chromium. Chromium is a common additive to leather watch straps which slows the aging process, but is a health hazard in high concentrations. ochs und junior’s vegetable-tanned leather straps and pouches are completely anti-allergic and age naturally — plus, no heavy metals need to be mined and recycled (or worse). 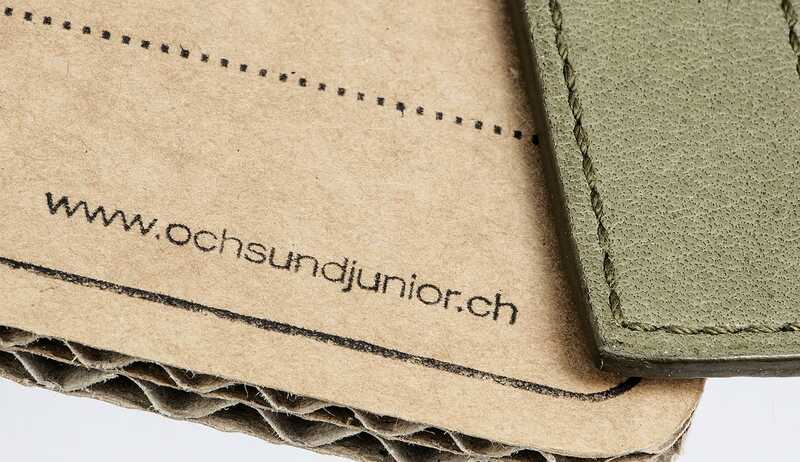 ochs und junior communicates its product line on ochsundjunior.swiss instead of with a printed catalog. This saves paper and ensures customers have the latest information. But it also means customers do not pay for any catalogs sent to potential customers in the price of their watch. ochs und junior will continue seeking ways to benefit its customers that are mindful of the environment. Earth Day was founded by United States Senator Gaylord Nelson in 1970. Further information can be found on Wikipedia and Earth Day Network. ochs und junior’s custom watch straps use Ecopell leather. Ecopell GmbH, based in Southern Germany, is the first leather maker to be certified according to the standard of the International Association of Natural Textile Industry (IVN). To receive certification, a leather manufacturer must pass a critical examination of every step in its leather-production process, from dyes to tanning agents to the environmental impact of its industrial processes.